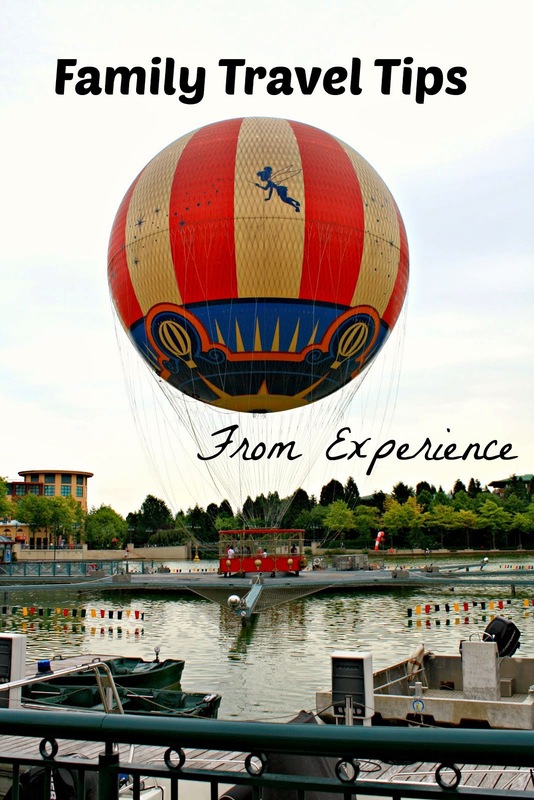 **Disclosure: We received complimentary samples in order to create a treat. No compensation was received. All opinions are 100% my own. What says Easter more than brightly colored, sticky sweet PEEPS? Yellow, blue, pink, purple and more PEEPS will brighten up Easter baskets all over in a few weeks. 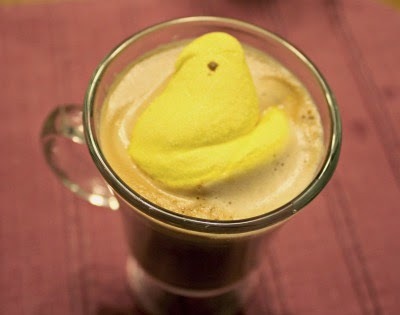 I had the opportunity to experiment with PEEPS recently and have come up with a fun latte perfect to add some spring fun to your morning. A little sweetness and a splash of color---lovely! However, I would like to share a few facts that I learned about PEEPS first. The very first PEEP chick was hatched in 1953. 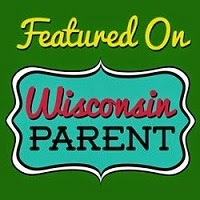 So, they have been a favorite for quite awhile! Now, enough PEEPS are produced each year to circle the globe not just once---but twice! Back in the day, it took 27 hours--with a pastry tube--to make a PEEP chick. With today's automated process, it takes 6 hours to make a PEEP. Big difference! The distance between LA and NYC is approximately 70,000,000 PEEPS. That is one long rainbow! PEEPS are made in the U.S.A.---further solidifying them as the perfect Easter treat for us! 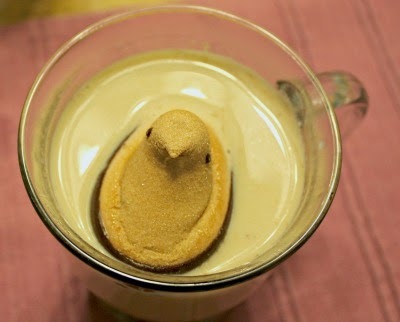 After checking out all of PEEPS' sweet offerings, I was inspired to craft a latte. My husband and I each crafted one of our own using some delightful and spirited items! 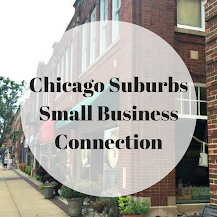 Here is how we flexed our Peepsonality! 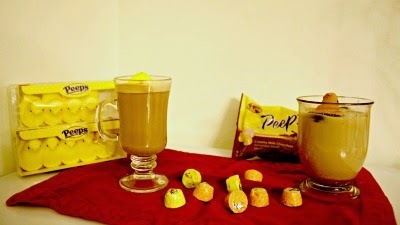 For this recipe, we were able to use Peepsters which are marshmallow cremes enrobed in chocolate, a chocolate dipped mousse PEEP dipped in dark chocolate and a traditional yellow PEEP. Make coffee. Mix milk, vanilla, cinnamon, ginger and maple syrup in sauce pan. Heat milk mixture until frothing. While milk mixture is heating, split coffee between two large mugs. Once milk mixture has frothed, pour half into one mug on top of coffee and half in the other mug. **Do not heat milk mixture to a full boil. 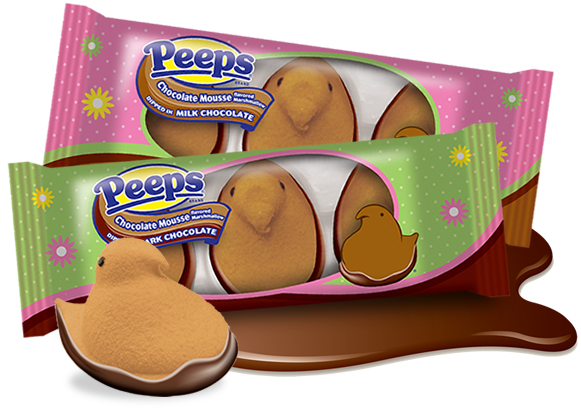 ** Plop in two milk chocolate Peepsters. The Peepsters will melt in the bottom. Put your PEEP of choice on top. They will start to melt. Mix a bit as you go.